Researchers at Drexel University have studied the brains of pilots while they were flying aircraft. They hope this new method will improve training methods and flight safety. Drexel professor Hasan Ayaz, of the School of Biomedical Engineering, Science and Health Systems, and professors, Frederic Dehais and Thibault Gateau, from ISAE-SUPAERO in Toulouse, France, set out to study how a pilot’s brain works during a flight. Their results were published May 17 in Frontiers in Human Neuroscience. A plane is an example of a human-machine system that requires input from a user, in this case a pilot. However, these systems are only as good as the humans that are directing them. Pilots have to be focused on many things while flying a plane, even more so when faced with a dire situation such as adverse weather conditions or an engine failure. “Unfortunately, many human-machine interfaces expose users to workload extremes, diminishing the operator’s attention and potentially leading to catastrophic consequences,” Ayaz told Drexel Now. In order for a human-machine system to be maximally safe and efficient, it would need to read the mind of the operator to determine how well he or she is paying attention and processing information. Ayaz and his team have come closer to making this a reality with a new technology that can read a pilot’s brain waves while in flight. They developed a portable functional near-infrared spectroscopy, fNIRS, system. The fNIRS system works similarly to a magnetic resonance imaging machine, but instead of having to be strapped into a large chamber, the technology is worn like a headband. This way brain activity can be measured while the wearer is moving around. The prefrontal cortex, the part of the brain under the forehead, is involved in decision making, impulse control and complex cognitive behavior. The fNIRS system measures blood oxygenation changes in this area of the brain. The fNIRS system was put to the test on 28 pilots, split into two groups. Half of the subjects were monitored while they were flying a real airplane and the other half were monitored while in a flight simulation. 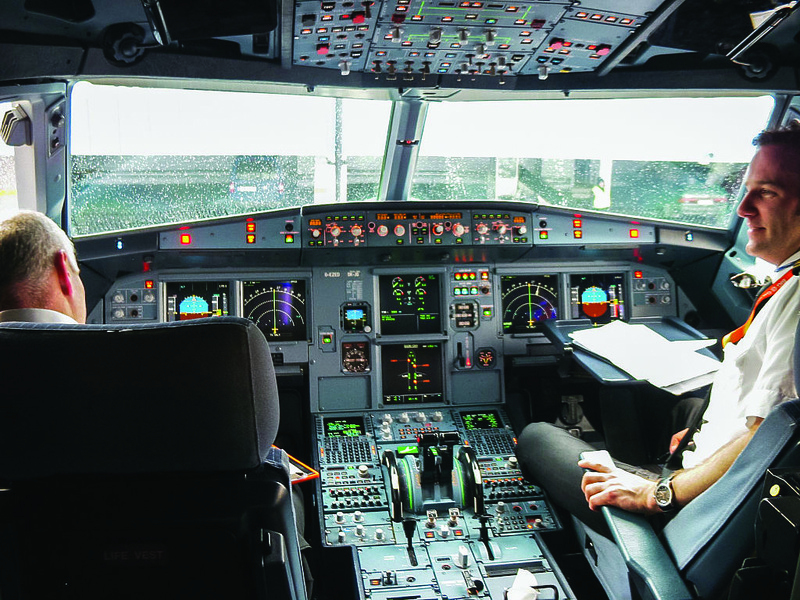 The researchers monitored the brain activity of the pilots as they completed memorization tasks from pre-recorded air traffic control instructions. These instructions varied in difficulty and were randomly assigned to the pilots in both groups. The results showed that pilots in real life flight conditions made more mistakes and had higher prefrontal cortex activation than the pilots in the simulator. This shows that measuring brain activity in real time during a flight is possible. Additional research in this area will give scientists an idea of how to make airplanes safer and more efficient. Also, the findings indicate that brain activity during a simulation is not the same as it is in the real world. Being able to further understand the interactions between a pilot and a plane could make simulations more realistic. “We believe that this type of approach will open a whole new direction of research for studying parameters in an aviation setting and eventually designing better machines,” Dehais said.